Today we are talking haircare. I don't know about you, but with this cold winter weather, my hair is even more crispy than normal. I get highlights which means that I bleach my hair and this cold dry Boston weather just adds to the dryness. A weekly hydrating hair mask is an absolutely must in my beauty regimen. 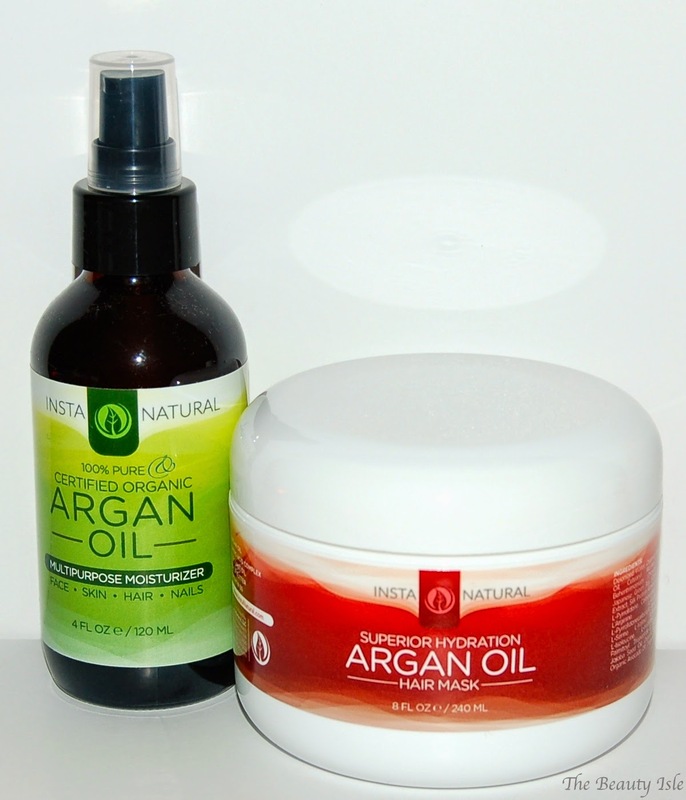 I was recently able to try the InstaNatural Argan Oil and Argan Oil Hair Mask. InstaNatural’s Argan Oil Hair Mask is a deep conditioning treatment designed to transform dry and damaged strands into soft, shiny, healthy hair. Its restorative ingredients – such as Argan Oil, Japanese Green Tea, Amino Acid Complex, Coconut Oil, Shea Butter, Jojoba Oil, Avocado Oil & Vitamin B5 – work together to penetrate hair deep down and deliver ultimate nourishment and hydration to enhance texture and shine. This intensive blend full of organic ingredients also serves to strengthen hair to defend against heat damage and other external aggressors. InstaNatural’s 100% Pure & Organic Argan Oil is a multipurpose moisturizer essential to helping you achieve beautiful skin, hair, nails and body. The cold-pressed oil is lightweight, fast absorbing, and free of fragrances, chemicals and preservatives. Whether you are looking to freshen and soothe dry skin, repair damaged hair, or strengthen brittle nails and cuticles, the application of natural Argan oil is a perfect addition to your daily regime. Argan Oil is truly the only ingredient in this product. Since I have a skincare regimen that I'm happy with, I only tried this product on my hair. I apply the mask generously to my hair after I shampoo. I then put on a shower cap and proceed with the rest of my shower activities which can take about 10 minutes. Then I rinse. This mask has a very strong sweet scent, extremely strong actually. I don't particularly care for it but I can see how others would love it. Luckily for me, the scent does not linger after the shower. I apply the Argan Oil to the ends of my damp hair. If I get ANY of it on my scalp/upper hair area, it looks extremely greasy. Once I add this oil to my ends, I have to completely wash my hands to ensure there is absolutely no more of this oil residue on my hands before I even think to touch the hair on the top of my head. The bottle says that since this is pure argan oil, it will have a nutty smell. No nut I've ever eaten smells like this. The scent of this oil is unpleasant but it disappears almost instantly once it's in my hair. 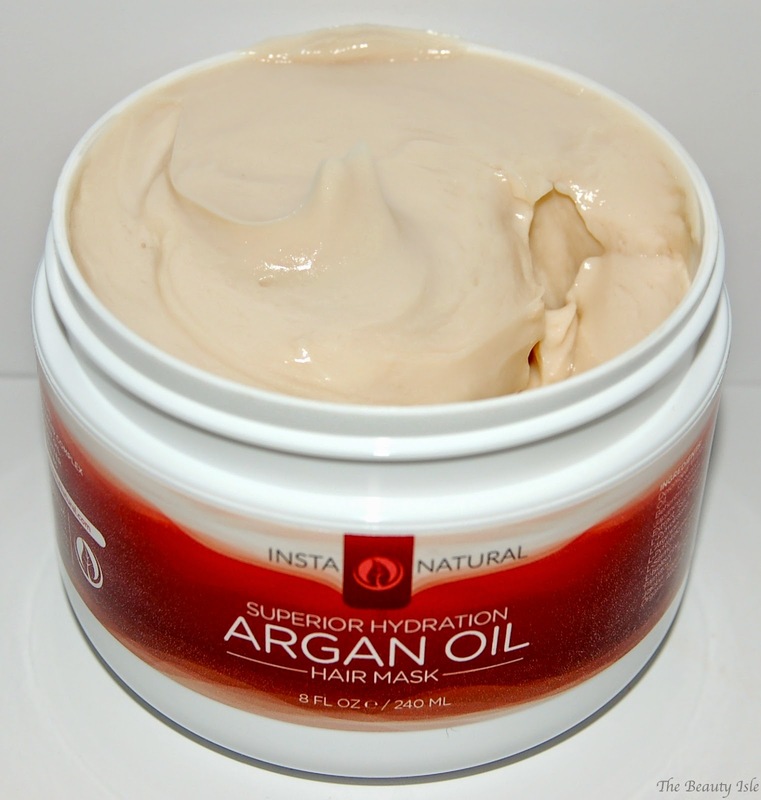 I really love the InstaNatural Argan Oil Hair Mask. It makes my hair look shiny, healthy, and almost bouncy. The Argan Oil does a good join of reducing frizz and making my hair look shiny. I'll probably try the oil on my hands at some point since they are getting super dry from this weather as well. You can purchase the hair mask here and the oil here. I think they are both priced really reasonably at $17.95 each. I love that these are sold on Amazon, it makes things so much more convenient.